- Helen tells Hannah that she can be a member of the pony club. - Paulo is coming along to the murder mystery weekend. Sam is a bit put out. - Marlene threatens to watch over Cody with an eagle eye whilst she lives in Number 24. - Helen tells Julie that if she continues to behave the way she has been, she doesn't want her living in Number 26 any longer. 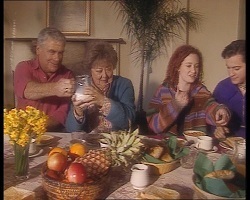 Helen, Philip and Debbie are in the kitchen having breakfast. HELEN: I was so angry, Philip, I could've cheerfully throttled her. PHILIP: Haven't we all been there, lately? He tells her not to worry about it because they all say things that they don't mean in the heat of the moment. Helen thinks that she should go down to the newsagency and apologise, but Philip says he'll speak to her as he's got to go down there anyway. PHILIP: Maybe Julie's calmed down enough to be able to talk about it rationally. Helen hopes that she hasn't made things worse between Philip and Julie. Philip tells her that they couldn't be much worse, just as Hannah appears from the bedroom. He wishes her luck at the pony club and leaves. Hannah asks what Philip meant by saying things couldn't get worse between him and Julie. She asks if they're going to get a divorce. 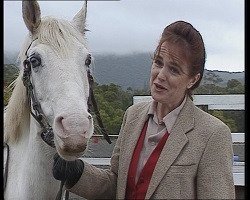 Helen dismisses it and changes the subject to the pony club. Hannah leaves to get changed. Debbie feels sorry for Hannah, reckoning that the tension between Philip and Julie must be hard on her. Helen thinks it's hard on all of them! DEBBIE: From where I'm standing, the States is looking better every day! Sam is eating breakfast, whilst Marlene is cooking. Cody comes in and says that she had a good night, although it took her a while to get to sleep as she was thinking about her parents. Cody is impressed with Marlene's cooked breakfast, but Sam teases Marlene, saying that normally she'd just get cold coffee and dry toast - the cooking is only to impress Cody! Sam announces that he's off to pick up the costumes for the murder mystery party. They chat a bit about the characters they've landed, and Sam grumbles that his character sounds boring. CODY: It's the boring ones you've got to watch out for! Marlene's character is an ex-chorus girl who's turned into a tap dancer. Marlene...starts to tap dance. (So this is where all of this started?! ARGH!) Sam decides to leave before she starts to sing. ...right on cue, Marlene sings and tap dances, and Cody joins in. Philip greets Julie, who's quite frosty. He tells her that he knows about the fight she had with Helen. Julie isn't surprised that Helen told him and accuses them of conspiring together to get rid of her! PHILIP: Julie, that's not true! Julie tells him that if her presence really is making everyone miserable, maybe it's time she left. Philip tells her that no-one wants her to leave, but Julie tells him that her mind's made up and as soon as she's found somewhere suitable, she'll be out of his hair. Philip tells her that she's being unreasonable - they can work it out, but not by themselves. JULIE: What's that supposed to mean? PHILIP: I think *you* need help. I think you need psychiatric counselling. JULIE: (appalled) Philip! You're the one who should be looking at your behaviour lately. If you're not off drinking with your mates, you're chasing a silly football around a field or raving about a stupid car rally. If you were really interested in saving our relationship, you'd be spending more time with me. PHILIP: (more gently) Ok, ok, I hear what you're saying. Maybe the murder mystery party will help us to relax. In a different atmosphere, we might be able to sort out some of our problems. Who knows, we might even have a bit of fun, eh? He holds her in his arms and rests his forehead against hers. He kisses her hair but Julie pulls away, upset. JULIE: Anyway, I'm not going. JULIE: You heard me. I'm not going. Why should I? I only spoil things for everyone. PHILIP: I give up. If you don't want to go, don't go but don't expect me to hang around and watch you wallow in self pity! I'm going, with or without you! He leaves. Julie looks upset. Debbie and Helen are talking about Philip and Julie. Debbie says that although they've had problems in the past, this time it feels different. They both reckon that Julie's lost the plot. 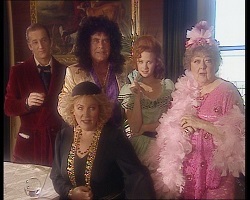 In the background, Hannah appears, but neither Helen or Debbie realise. DEBBIE: Do you think they'll get divorced? HELEN: Well, they certainly can't go on like this much longer. Hannah makes her presence known and they stop talking. They gush at how wonderful Hannah looks in her riding gear, but Hannah is upset because the jumper is too big (although it actually looks as if it's about the right size but she's just wearing it oddly). Hannah asks what they were discussing and when Debbie lies, Hannah accuses them of always talking about stuff to do with Philip and Julie behind her back. She reckons she has a right to know what's going on. Helen and Debbie decide that they ought to include Hannah, so Helen tells her that they were talking about how worried they are about Julie. Hannah says that Philip and Julie don't love each other anymore. Helen says that they still care about each other a lot, and even if their feelings for each other change, they still love Hannah. Helen tells her not to worry too much. Hannah looks sad. Lou and Cheryl are dressed up for the murder mystery party. They discuss their characters with Brett and Danni. Cheryl's a fortune teller, and Danni says that she can't be that good of a fortune teller or she'd already know who the murderer is! Cheryl reckons that they're just jealous, but Danni laughs about how she obviously wants to go and play dress ups instead of going to see Michael in Adelaide for a romantic reunion. Brett's miserable because he wants to have a romantic reunion with Lata. Danni makes a joke out of it, saying that although Dahl's not as good a kisser, at least he's got the galah Lata gave him! Brett is unimpressed and stalks off. Cheryl tells her that she should be more sensitive. Danni says she didn't realise how much in love he was, and if he feels half as bad as she does being apart from Michael, she thinks Brett needs all the sympathy he can get. Helen and Hannah turn up to the pony club, where the woman who runs it tells Hannah she can't participate as they're already full. Helen's confused as she was told over the phone that she was more than welcome. They argue a little bit, and then Helen realises that the woman is unimpressed with what Hannah's wearing. Hannah protests that she just wants to ride her horse and it doesn't matter what she looks like. The woman says she can ride her horse - just not at the pony club! She leaves. Hannah and Helen don't look impressed. Helen approaches the woman again and tells her about there being trouble at home for Hannah. Helen says that she's only happy when she's riding her horse, and asks her to let Hannah ride today and next week, Helen will ensure she's wearing the right clothes. The woman relents. Hannah is stoked. Rick, Paulo and Ren are getting ready to leave for the murder mystery party. Ren mocks Rick's French accent. Paulo is playing an English eccentric and Ren's his Southern American wanton mistress. They fool around for a bit before leaving. RICK: Man, I cannot wait to see some blood and guts! REN: There won't be any blood and guts. It's all pretend. RICK: What about dead bodies, man? RICK: I want my money back! Lou and Cody are walking up to the hotel. Lou thinks it's a shame that Doug and Pam couldn't make it. He says he's going to miss his old drinking buddy and Ramsay Street won't be the same without them. Marlene is tap dancing at the top of the stairs. Ren and Paulo run past Rick and Sam, laughing in character. Sam is carting luggage up the stairs and Rick jokes that some men were made to be lovers, and others were made to be handbags. Sam isn't too impressed and tells him to keep his opinions to himself. Philip thanks Debbie for coming along at short notice - it would've felt strange being without a partner. Debbie says that it wasn't a hard decision, seeing as the alternative was being stuck at home with Julie for the weekend! He says they should forget about home and concentrate on having fun. Danni apologises to Brett for hurting his feelings about Lata. She recommends a dose of chocolate to help cheer himself up. Danni suggests that he could ask Lou and Cheryl for a trip to see Lata in the future. Brett thinks that's a great idea and says he'll write to Lata. 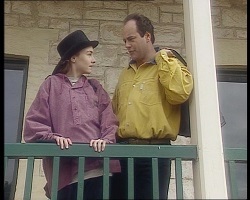 Danni's taxi arrives and Brett tells her not to do anything he wouldn't do. Danni scoffs that she's going to do *everything* that Brett wouldn't do! They laugh and hug. Danni winces at her ear being in pain and Brett thinks she needs to get it looked at. Danni leaves and Brett starts to stuff himself with various chocolate goods. Julie is at work and Helen arrives. Julie is frosty towards Helen, reckoning that she should be off with Philip conspiring for the best and quickest way to get rid of her! Helen tells her that's not true and Number 26 is as much Julie's home as anyone else's. Julie snaps that Helen wasn't singing that tune last night! Helen tells her that last night she was very angry and she said things that she wishes now that she hadn't. She apologises and Julie accepts it, although Julie warns her it's too late - she's already told Philip that she's moving out. Helen thinks that Philip and Julie can still sort things out - they just need to talk to each other. Julie tells her that they can talk until they're blue in the face but this time it won't make a difference. 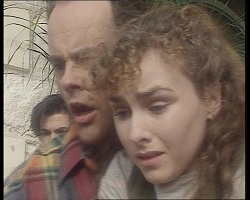 Helen urges her to try - for Hannah's sake. Julie thinks about this and then says that Philip will have already left for the murder mystery party. Helen tells her that there's nothing to stop her from driving up after him. Julie agrees to go and hugs Helen. Julie thanks her. Everyone is in costume and larking about in character. 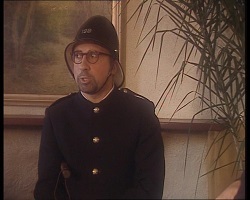 They are interrupted by a 'policeman' (who is played by Elliot Goblet). 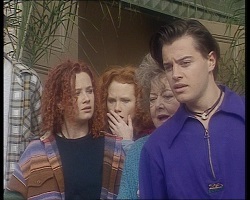 Rick recognises Elliot but spends the rest of the scene trying to remember Elliot's name, with no success. The policeman announces that an art critic has been found murdered in his room, and as they were all here, they're all considered as suspects. They'll all be given 24 hours to hunt for clues to prove their innocence. Everyone is sat around a table and they're going through the various clues, trying to work out who could be the murderer. The strongest evidence seems to be pointing towards Rick and everyone is bantering whilst Rick protests his innocence. Julie appears in the doorway and after watching the scene, goes over to Philip and crouches by him. Julie's very upset and says that they have to talk. He's stunned that she thinks that *now* is the most appropriate time and when he loudly points out that people are trying to have fun, the room falls silent. They both become painfully aware of everyone watching them. JULIE: (very upset) All right. If that's how you feel, then I'll leave. You obviously think having fun is more important than saving our marriage! She storms out. Philip follows her. The room stays silent for a minute, and the policeman breaks the tension by saying that the hunt for the murderer is on. Hannah is bragging about how she had the best posture on her horse and that the other kids had been riding for ages. She reckons that she must be a natural! HANNAH: I don't like to boast, but that is what she said. Hannah can't wait for next week but Helen suggests that she might want to go to a different one next week - one that's a little more casual and a little less uppity! Hannah wants to stay at the same one because she's just as good - if not better - than those other girls. HELEN: I think you might have trouble putting on your riding helmet if you continue to boast like this. Hannah decides to ring Miranda to boast to her! She spies a chocolate cake, which apparently Brett brought over after making himself feel sick! When Helen tells her the list of things Brett ate, Hannah worries that Brett's turning bulimic like Debbie - but Helen reassures her that he's just having girl trouble so he's comfort eating. 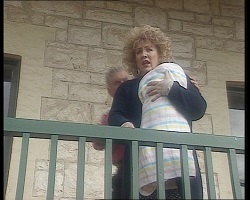 It's morning and Cheryl is walking Lolly around on the balcony. Everyone is having breakfast and they're all bantering about who could be the murderer. Rick confidently tells everyone that he's figured it out and knows who the murderer is - the butler! Everyone laughs at Rick's joke and then they hear a loud scream from Cheryl. Everyone gets up. Cheryl is looking, in shock, over the balcony. Everyone piles outside and we can see a body lying on the grass below. RICK: Cool! Two murders for the price of one. REN: Who's the victim this time? 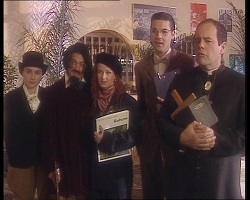 As they get closer, they all realise in horror that it's Julie. Debbie screams for Philip, who is last to leave the breakfast room. 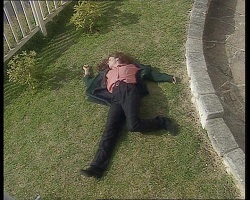 He runs down the stairs and yells Julie's name when he realises the body is his wife. He and Debbie rush over to her body and everyone else looks stunned.